The river Ganges occupies the pride of the place. Situated on its banks is Ambika –Kalna. In all probability it was previously known as Ambika only. Mention of Ambika is found in Ain –e–Akbari authored by Abul Fazl the renowned courtier of Mughal Emperor, Akbar. Under the Satgaon Sarkar from 1582 A.D there were 53 Parganas and Ambika's name figured first on the list. Ambika and Kalna were close to each other and a large portion of the sub division of Kalna being within the periphery of Ambika. Pargana, at one time Ambika became more prominent. Later Ambika became subdued and Kalna was well known, so much so that even the rail station was named Kalna Court.With the spin of the wheel of time it was renamed later as Ambika-Kalna. One of the DWADASA GOPALS and a close associate of SRI CHAITANYA and NITYANANDA PRABHU was Gouridas. After taking permission from his elder brother Suryadas, he shifted his residence from his native place Shaligram to Kalna. At that time the area was more popularly known as Ambika. This fact is authenticated by the famous historical treatise on Gaudiya Vaishnavism "BHAKTIRATNAKAR" penned during the middle ages. Muragacha is a rail station on the Eastern Railway on the Sealdah – Berhampore Court line. From Muragacha one proceeds to Dhan-nada – a small hamlet. On the North East of Dharmada lies Shaligram. Gouridas's presence at Ambika is also mentioned in " SRI CHAITANYA PARISHAD JANMANIRNAY" and "CHAITANYA SANGITA". Apart from these three books, Gouridas Pandit's name and his exploits are mentioned in SRI CHAITANYA BHAGWAT, SRI CHAITANYACHARITAMRITA, CHAITANYAMANGAL authored by Jayananda, ADWAITA PRAKAS by ISHAN NAGAR, VAISHNAVA ABHIDHAN, DWADASPAT NIRNAY, ANANTASANHITA, SUBALMANGAL, GOURGANODDESH DIPIKA, BHAKTAMAAL, VAISHNAVAACHAR DARPAAN and VAISHNAVA VANDANA penned by Daibaki Nandan. Gouridas Pandit also finds mention in Brindaban Das Thakur's VAISHNAVA VANDANA. Incidentally, NITYANANDA PRABHU had profound influence on Brindaban Das Thakur and he was also the last disciple of NITYANANDA PRABHU. Gouridas Pandit's birth as mentioned in scriptures was in 1485 A.D.He was more or less the same age as SRI CHAITANYA MAHAPRABHU. His father was Kansari Misra and mother Kamala Devi. They were six brothers, namely Damodar, Jagannath, Suryadas, Gouridas, Krishnadas, and Nrisinhachaitanya. Their original surname was Ghosal (Sarkhel). To lead a secluded life, Gouridas left Shaligram and settled on the banks of the River Ganges at Ambika. He took along with him the shalgram shila (black stone being the symbolic representation of Lord Vishnu), Damodar which he worshipped daily. It appears from his traits that since his childhood he was oblivious of this material world and had a holistic approach towards life. On the opposite bank of Ambika Kalna was Santipur – the home of Adwaita Acharya. It can be assumed that Gouridas Pandit must have heard about Adwaita Acharya and Chaitanya Maharabhu. But not for once did he go to visit them. 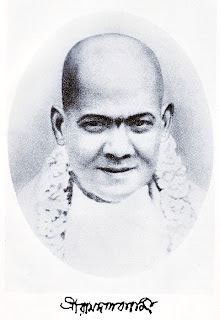 Shibananda Sen was a well known aide of Sri Chaitanya Mahaparbhu. His son was born dumb but as a toddler, he sucked the great toe of Sri Chaitanya Mahaprabhu and regained his power of speech. Later on he became to be known as KabiKarnapur the author of the famous " Gourganoddesh". In this book he proclaimed that Gouridas Pandit was the incarnation of Subal. This is further supported in the books "Vaishnavachardarpan","Ananta Sanhita", "Bhaktamal", "Vaishnavabandana", "Adwaltaprakash","Chaltanyasangita". In Vrindaban, the close associates (Sakha) of Lord Krishna were divided in four categories. Namely Sakha, Suhrid, Priyasakha and Priyanarmasakha. Amongst the Priyanarmasakha, the role of Subal was the most illustrious,. This was authenticated by Sri Rupa Gowasmi in his book "Ujjwalnilmani" where he states that only Subal had abundant access to Lord Krishna during His most intimate moments. This further strengthens the belief that Subal was indeed favoured by the Lord. Subal, later on incarnated himself in the form of Gouridas Pandit . Now with even more conviction and maturity. This has been amply ilustrated in the life of Gouridas Pandit. He had heard of Nimai Pandit (Sri Chaitanya) while at Shaligram and on arriving at Kalna it was quite well known to him. But not for once did Gauridas Pandit go and meet Nimai. It was as if to say that " You are my Lord. Hence you must come first to meet me". Ultimately it turned out that way. During his stay at the residence of Adwaita Prabhu at Shantipur, one day Mahaprabhu set off on a boat and crossed the river Ganges and landed at Kalna. There are differences of opinion whether Mahaprabhu came alone or he was accompanied by some one else. While some say it was Nityananda Prabhu who accompanied Him, others say it was Basudev Ghosh. But according to the authentic text "Bhaktiratnakar", it was Mahaprabhu who came alone. In all probability he had not met Nityananda Prabhu at that time. For the first time Mahaprabhu accepted Gouridas Pandit's hospitality at Ambika Kalna. While returning to Nadia, Gouridas accompanied Mahaprabhu. At Nabadwip, Gouridas was completely overwhelmed by Mahaprabhu who gifted a copy of the Gita written by him on palm leaf to Gouridas. After some time Gouridas returned to Kalna. His entire entity was now totally engulfed by the influence of Mahaprabhu. The Gita became the symbol of Mahaprabhu at the time of separation and he felt Mahaprabhu's existence at the touch of it. The second time Mahaprabhu visited Gouridas Pandit, he was accompanied by Nityananda Prabhu. It was after his initiation as a Sanyasi and prior to His departure to Nilachal. Gouridas must have been saddened at the sight of shaven headed Mahaprabhu in garb of a Sanyasi but he accepted it knowing very well that it was inevitable. Mahaprabhu stayed for some time and sensing Gouridas's restlessness, Mahaprabhu asked him to bring neem wood from Nabadwip and carve out two idols of Him and Nityananda Prabhu. Gouridas did as he was ordered and two idols were carved out. On completion the idols were consecrated as per the rites and installed on a throne. Till now plain facts and authentic documented history has been narrated. But there are more than what meets the naked eye. Some facts which defies our reason and intelligence. Standing in the courtyard of Gouridas Pandit's house one sees five doors side by side at the entrance of the main temple. Only the middle door is opened and then closed immediately. Obviously one becomes curious to know the reason behind it. The view of the sevaits and hearsay have the following to say. After the consecration ceremony was over, Mahaprabhu confided to Gouridas of His decision to depart for Nilachal as it was preplanned. With tearful eyes Gouridas bade farewell to them and returned to the temple in his house to perform his daily rituals. While conversing with the idols he found the idols to be immobile. He rushed back to the two travelers (Mahaprabhu & Nityanandaprabhu). Sensing his urgency the two of them came back and immediately the two idols descended from the throne and walked towards the courtyard. But when Mahaprabhu and Nityananda Prabhu ascended the throne. They were transformed into two idols much to the dismay of Gouridas. Again he ran back to the two who descended from the throne and implored them to come back. This situation continued for some time. It was now time for the afternoon offering to the Deities. It was decided that the two of them would proceed after their after noon meals. Accordingly offering was placed before the four of them. The two idols and the two living beings accepted the offerings. After resting for some time it was time for them to depart. Again tearful, Gouridas bade them farewell. This time Mahaprabhu himself confided to Gouridas that He would accept whatever Gouridas offered him but that would be in solitude, not in public view. Since this episode, much time has passed and in the mean time Mahaprabhu left this material world in 1534 A.D. Devotees in large numbers thronged Gouridas's house to have darshan of the deities. But Gouridas on hearing of Mahaprabhu's demise had closed the gate of the temple permanently. He feared that the two idols may leave him again or that they be removed by any body in the guise of a devotee. With the passage of time Nityananda Prabhu too departed in the year 1542 B.S. Wind carries the word of mouth. Nityananda Prabhu's wife Jahnava Devi came to know that the devotees returned heart broken without having a darshan of the deities. It is pertinent to mention here that Jahnava Devi was the younger daughter of Suryadas Pandit, the elder brother of Gouridas Pandit. Without prior information , one day she arrived in a palanquin at the house of Gouridas Pandit from Khardah, and narrated to the Pandit the plight of the devotees. It was decided that the doors of the temple would be opened to the devotees but only for a glance of the deities. The time taken to view the deities from head to toe. Since then this practice has been maintained and the devotees have been able to quench their thirst by having a glance at the Deities. Although nothing of mention is found in the accepted history of Gaudiya Vaisnavism about Gouridas Pandit but he was beside Nityananda Prabhu at the Dandamahotsav at Panihati according to "Sri Chaitanyacharitamrita." 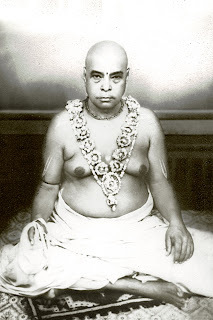 On attaining mature age, Gouridas Pandit handed over the management of the Sripat to his worthy disciple Hridaychaitanya and proceeded to Vrindaban. His mortal remains remain buried at Dhir Samir in Vrindaban. Near by the Sripat of Gouridas is the Sripat and temple established by Suryadas, elder brother of Gouridas. Here the deities of Nitai-Gour and Shyamsundar are worshipped. Another important and sacred place in Kalna is the Asram of Siddha Bhagwandas Baba. The Sri Naam Brahmaji (5.6" X 1.2") engraved on Muchkunda wood and worshipped by Siddha Bhagwan Das Baba can still be seen. Sri Ramkrishna, Sri Bijay Krishna Goswami and Iswar Chandra Vidyasagar visited Kalna to have a look of Bhagawandas Baba. Other than these there are various Sakta Pithas, Vaishnava Temples, Shaiva Temples and places of importance of Christian, Muslim and Buddhist religions in Kalna. The aforementioned Babu purchased a Math in Puri. The Math was named Radharamana Kunja after the name of the deities installed there. It was situated in a secluded place, where the environment was peaceful, and Babaji Mahashaya often lived in it. One day he called Navadwip Das Babaji and said, "Navadwip, go and invite some ananda-murti Vaishnavas for the prasada of Radharamana." Navadwip Das was surprised, because Babaji Mahashaya used to say that all Vaishnavas were by nature ananda-murti, that is, they were the very image of ananda. Why then, he thought, did he specify the ananda-murti Vaishnavas? Obviously, he wanted to invite some special category of Vaishnavas. Navadwip Das, who was one with Babaji Mahashaya in thought, word and deed, however, did not lose time in understanding which class of Vaishnavas he wanted to be invited, and said, "The Vaishnavas have been invited." "What?" said Babaji, "You have not yet gone anywhere. How have the Vaishnavas been invited?" "The Vaishnavas were invited the moment you desired them to be invited!" replied Navadwip. This was the conversation between the two siddha-mahapurushas. Each understood what the other meant, but no one else could under-stand it. Babaji added, "Some sweets, curd and pattals will also be required. But you need not bother about that, Nitai will arrange for everything." At about ten o'clock came a man and a gvala (cowherd) with some sweets, curd and pattals. The man said to Babaji Mahashaya, "I have brought these things for the bhoga of Radharamana." Babaji asked, "Did someone ask you to bring them?" "No," replied the man, "I went to Jagannath's temple for darshan, and when I reached Simhadvara it came to my mind that I should offer some sweets to Radharamana. So I went to the sweet-seller and asked him whether he had any fresh rasagullas for Radharamana. This gvala was also there, and he said, "Baba, I also have some curd for Radharamana." "Very well," I said, "How many pots of curd have you?" He said, "Four pots." So I asked him to come along with me. As we were coming, a cloth-merchant named Haripatra asked me, "Where are you going?" "I am going to Barha Babaji Mahashaya," I replied. Immediately he said, "Then I need not go. You may kindly give him this milk and khanda (raw sugar) and also these plantain- leaves. If he asks anything you can tell him that Nitai Chand has so wished." Navadwip Dada had so far been sitting quietly. Suddenly he shouted "Bol Nityananda!" and shot out dancing and singing, "Bol Nityananda bol, Nityananda bol"
At 12 o'clock Babaji Mahashaya heard sky-rending sankirtan sound coming from outside the kunja. Immediately he went out and saw Navadwip coming along with a crowd of one hundred children, boys and girls, dancing and singing like one, who had gone mad and was completely lost in himself. As the crowd came near, Babaji Mahashaya also joined it and began to sing. The children surrounded him and began to sing, "Bol Nityananda bol, Nityananda bol!" with renewed vigour and enthusiasm. sankirtan went on for about an hour. Then Babaji Mahashaya made the young ananda murti Vaishnavas sit in a line for prasada.. Yes, they were Vaishnavas because Babaji Mahashaya regarded everyone who resided in the Bhagavata-dham Puri as a Vaishnava, and anandamurti, because the children were simple, pure-hearted and joyful by nature. Jai Gopal was asked to serve prasada. He was in a quandary, because the prasada was sufficient only for about twenty persons and he had to serve it jo about one hundred twenty persons, including the beggars who had arrived on the scene. So, he was serving in small quantity. Babaji Mahashaya was aware of the situation. He said angrily, "What are you doing? Serve well and serve full. Why are you so calculative? You have been asked to serve, not to calculate. Leave that to mahaprasada itself. Don't you know that mahaprasada is chinmaya and merciful? If you don't have faith in mahaprasada, what kind of a Vaishnava are you?" Jai Gopal began to serve accordingly. And what a surprise! Each one of the one hundred twenty persons took the prasad to his hearts content, yet what was left was more than enough for the fifteen persons living at Radharamana Kunj. Sreepat Bharatpur is situated in Kandi Subdivision of District Murshidabad. It consists of nineteen localities. The holy temple of Gadadhar-Nayanananda is Situated at Goswami Para (Western side of Bharatpur). Gadadhar Pandit is a widely discussed name in the circle of Gaudiya Vaisnava devotees. His father Madhab Mishra used to stay at Beleti village in Chittagong (now in Bangladesh), where Gadadhar was born, on the auspicious new moon in the summer of 1408 (Shakabda). His brother was Baninath. Gadadhar spent long twelve years in Beleti; he reached Nabadwip when he was thirteen only. He was younger than MAHAPRABHU. Despite that, he became very much intimate with the latter. They used to attend the same school (Path Sala) and always moved together. No force could separate them. Since his boyhood, Gadadhar was very calm and quiet, reasonably patient in nature and devoid of earthly attractions. He liked lonely atmosphere. MAHAPRABHU was exactly opposite in nature. Always pulsatile and bubbling with energy, he somehow chose someone from somewhere for complicated discussions on Nyayashastra and left him perplexed and a laughing stock. Gaddhar, on the contrary, disliked this mock fight and heckling tendency. He occasionally remained aloof from MAHAPRABHU, but the latter never let their bond loose for even a moment. Instead of getting ashamed, he frequently declared "Dear friend, just see, I will soon prove myself to be such an extraordinary devotee that Lord Brahma, Mahewar, and others will come down to find me out". Gadadhar's intimancy with Mukunda Dutta was similarly beyond description. At that time, learned people from all corners used to conglomerate in Nadia. Some came for practicing higher level of knowledge, some for residing near the Ganges. Mukunda regularly reached these news to Gadadhar One day, Pundarik Vidyanidhi, the zamindar of Chakrashala (Chittagong) came to Nabadwip. Incidentally, some days back, while singing holy Kirtana, MAHAPRABHU had burst into tears, crying "Pundarik my dear, Pundarik, my dear I" His sudden change of temperament made Gadadhar extremely curious. Subsequently, MAHAPRABHU described about Pundarik in details. According to Him, merely uttering or hearing the name of this Brahmin devotee anywhere made the place holy. In his dress and dealings, he appeared to be a high profile familyman, but his devotion for lord Krishna was so pure that "it floats like a life boat even in the midst of a turbulent sea". And to add more, "He never takes bath in the river Ganges, lest his feet touch Her. He pays Her homage at night (because), even the sight of people polluting the holy river with dirt, cause excruciating pain within him". Mukunda and Gadadhar were present there. Eventually, inquisitive Gadadhar with his friend, met Pundarik. One day but he was stuck dumb with disgust! What sort of Vaishanava this man was, he asked himself! A well nourished physique, lavishly made up with costly garments and perfume! To him, Pundarik appeared to be as aristocrat as a prince, sitting in the midst of admirers! What a Vaishanava! Mukunda would read his hopelesness. Then, to rectify the misconception, he went in front of Pundarik and recited two slokas on SRIKRISHNA from Sri Bhagabata. As soon as it reached his ears, Pundarik's mood got completely changed, as if some eternal force took him over to an entirely differfent state of mind, tears rolled down his cheeks. Gadadhar was taken aback. He felt so much guilty within that he bowed Pundarik and left the place as soon as possible. Later on, he discussed the whole episode with Mukunda. It was finally decided that he would take 'Diksha' from Pundarika, whom MAHAPRABHU himself often referred to as 'the symbol of total love'. Anyway, the whole ritual was successfully executed on next twelth day of full moon MAHAPRABHU already gave him green signal. Gadadhar, after his Diksha, dedicated himself wholeheartedly to his Master's lotus feet. After performing rituals for his deceased father, Nimai Pandit came back from Gaya. Since then, Gadadhar never left him for even a moment. But Nimai Pandit gradually appeared to be a different one as if, continuously searching for a newer meaning of life. Gaya was the first place where the hidden and unique fountain of all pervading love sprang out from and started to flow. After coming back to Nabadwip, the stream gained a barrier breaking speed and flooded everywhere. The vast impact of this movement changed the stagnant surroundings to something kinetic. The volcano of heavely love went on errupting. The shattered and exhuasted common man's life was bathing in it and waking up in a newer spiritual realm. One day MAHAPRABHU was discussing on SriKrishna just outside Suklambar Brahmachari's house. Gadhadhar came in time and kept waiting inside. The audience was nearly mad, bathed in the heavenly essence of Sri Hari. Gadadhar heard everything and sobbed helplessly. After the discussion was over, MAHABPRABHU asked: "who laments there" ? "He is none other than Gadadhar" replied Suklambar. The Master, highly admiring of his genuine devotion, went inside the house and embraced him. Another day, after crossing the congested areas of Nabadwip, tired MAHAPRABHU took rest in a lonely place by the riverside. Mukunda Dutta started singing 'Purbaraga'. Gadadhar Pandit made a garland with flowers available over there presented it to the master and sat by his left side. 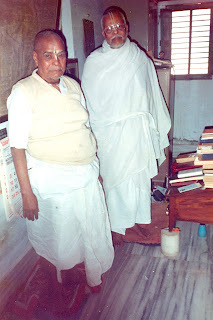 Sri Nityananda was on his right. All of them started singing and dancing around him. Seeing all those, perplexed Adwaita Prabhu, began to worhsip MAHAPRABHU with holy flame. On Vijaya Dashami, 920 B.S, MAHAPRABHU started for Vrindaban (fronPuri). Gadadhar, in fact disobeyed the discipline and protocol of 'Kshetrasannyasa' and left Puri as the separation with His Master was unbearable. While He was in Cuttack, MAHABRABHU fetched Gadadhar by some devotees and asked him to go back to Puri to complete his "Kshetra Sannayasa". But the Gadadhar replied : "0 Lord ! To me any place you stay is synonymous to Nilachal. "Kshetras-annyasa" matters little". The Master further ordered him to go back and serve Lord Gopinatha; again, Gadadhar replied "when I look at your lotus feet, I feel more satisfied than worshipping all Gods for thousand times". 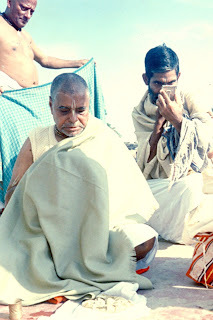 His love for Sri Chaitanya was fathomless and beyond all logic; that was why he was able to disobey all his orthodox commitments of Kshetrasannyasa.MAHAPRABHU, though happy within, emphatically ordered him again to start for Nilachal, otherwise the former would curse himself for his devotee's attitude of disrespect towards God. As the master proceeded towards his boat, Gadadhar fell faint on the ground. Sarbabhouma was asked to take him back to Nilachal (Puri). Since then, MAHAPRABHU frequently stayed at the temple of Tota-Gopinath. Here, it is said, he disappeared in the statue of Sri Gopinath. He was only a few months after his fortyseventh year. Gadadhar Pandit lived only eleven months more after his greatest friend philosopher and guide had passed away. Memoirs of the past and unruly tears constantly accompanied him. He somehow dragged his existence for the purpose of suitably and permanently arranging flawless 'Seba' programme of Tota Gopinath. Otherwise therewas no reason for him to survive even for a moment in absence of his "MAHAPRABHU". Ultimately, Gadadhar started his voyage from mortal world to immortal one when he was only fortyseven years and a few months. Nayanananda, the eldest son of Baninath used to live with Gadadhar since the last days of Sri MAHAPRABHU. During his last days, Gadadhar, physically exhausted and mentally shattered, gave Nayanananda a manuscript of Gita copied by himselt and a Bigraha (small statue of God Krishna) regularly worshipped by himself. He asked Nayan to found a temple in a suitable place in Sri Gour Mandal, and continue the 'Puja'. In the manuscript, MAHAPRABHU himself wrote a 'sloka' which reveals the numerical assessment of 'Slokas' present in original Gita. The manuscript has recently been scientifically processed for preservation. Rare Manuscript preservation Deptt. of Govt. of India played an active role in this regard. Nayan was not only his nephew but also an extremely affectionate disciple. Naturally, to carry out the last order of his Master, he left the place with the statue and the manuscript. He travelled, extensively in Gourmondal. His tenacity mainly rested on unconditional loyalty towards God and firm belief on his Guru. While moving from place to place, he used to recite, "Let your desire be fulfilled in my lifetime". Ultimately, one day he reached his destination, Bharatpur. At that time, the Zamindar of Bharatpur was a good soul, who belonged to Sur Dynasty. He wanted to construct a Vishnu-Vaishnava temple and hand over its entire management to a genuine devotee. At that critical juncture, they met each other. Seeing the statue of Lord Krishna hanging from his neck, the zamindar came forward. The introductory dialogue was casual but in no time, their acquaintance took a permanent shape. The zamindar made all possible arrangements for Nayan's comfortable living and regular worshipping of MeyaKrishna" in Bharatpur. For the purpose, he lavishly donated land for cultivation, several ponds and orchards. Nayan made his 'Bhadrasana' over there and completely dedicated himself to God. In course of time, the heavenly cult of 'Meya Krishna' got enriched by some additions.If one visits Bharatpur at present, one may see the following Bigrahas on a medium-sized wooden throne. On extreme right, the statue of 'GOURANGA MAHAPRABHU' with a flute in his hand. 'Meyakrishna' is placed in the middle. To his left, a black statue of 'Gopinatha' approximately 12" in height, holding a flute and standing on a lotus made of stone. In front of Gopinatha, the special Shalagram-Vishnu Chakra, His representative. To the left of Gopinatha, is the 10" statue of Srimati Radha, made of eight metals. In anterior part of of throne, stand several statues of 'Gopala' and Shalagrams. In the evening, all of them are transferred on a bigger throne. In the morning they are placed facing south rind in the evening, facing west. It may please be noted that the model of God Krishna worshipped by Gadadhar in Puri was called 'Gopinatha'. the similar one worshpped by Nayanananda was also named 'Gopinatha' as desired by his Master. Nayan collected a naturally dislocated tooth of Gadadhar. While in Vrindaban, he erected a temple in Keshi Ghat and buried the tooth there. This place is known as Pandit Goswami's Danta (Tooth) Samaj. A model of Radha and Krishna built together worshipped here is also known as "Radha Gopinatha".Nayan's fascination for the name of "Gopinatha" reflects his master's deep regard for the very name. The present generation of the family, till this day, has been able to preserve the original tradition and culture they inherited from there ancestors They sincerely perform all holy deeds, including regular worshipping schedules and arranging festivals, as was done by Nayanananda in his lifetime. The main yearly festival of Sreepat Bharatpur is Birthday Celebration of Gadadhar Pandit. Local people and devotees from far and near attend the occasion and take active part in this three days' celebration. This includes holy Adhibasa, Nama Sankirtana, distribution of Prasada, community song and other functions. The place at this time often vibrates with thousands' voice roaring "Our GOURANGA is Gadadhar's life". After taking 'Sannyasa' Sree CHAITANYA started for Katwa. He crossed the Ajoy (river) and entered the Radh region, surrounded by dense forest. His followers were Nityananda, Gadadhar, Acharyaratna Chandrasekhar and Mukunda Dutta. As the saying goes, MAHAPRABHU and others sat by the side of Kuye, a tributary of River Mayurakshi, flowing along north east of Bharatpur. As he washed his feet there, the spot became famous as Dhoya Ghat (Dhoya means washing or cleaning), which exists till this day. He took rest in an adjacent village, called Alugram – Vishramtala (Resting place). His feet also fouched Sreepat Kanchan Garia where Dwija Haridas used to stay. That might be the period when he walked through Bharatpur. No doubt, the speculation smells very positive and logical. The local people are quite aware of it, and feel proud of their heritage. So, come one and all ! Let us bathe in the holy dust of Sreepat Angan, touched and blessed by MAHAPRABHU SRICHAITANYA. Let all thirsty souls be filled to the brim with eternal joy. Please see the Meya Krishna" deity given to Nayanananda Misra by Sri Gadadhar Prabhu here as http://nitaisundar.blogspot.com/2008/05/meya-krishna-deity-of-sri-gadadhar.html. Of the many places visited by Babaji Mahasaya during His lifetime. Bankura enjoys an exalted position. Not only Babaji Mahasaya stayed here in long stretches but also quite frequently. He had a huge number of followers and admirers here . They included the common people, the devoted, the intellectuals as well as people from every sphere of life. In the beginning though, Babaji Mahasaya had His share of non-believers, skeptics and antagonists too. Later on these were won over by Babaji Mahasaya's charm. It is not surprising that Bankura was witness to Babaji Mahasaya's unique feats which at times verged on the supernatural. Bishnupur, a town in Bankura. The venue- Sarvamangala temple on the banks of Lalbandh. (Bandh means an embankment or dam). Here the Holy name " Hare Krishna. Hare Krishna Hare, Hare" was chanted every year for three days continuously as Naam Yagna was performed. Lot of people gathered here for this joyous occasion which was started by the Late Ramrup Bhattacharya. One of the organizers of this occasion was Kaviraj Rishikesh Dasgupta. Babaji Mahasaya was invited to be present on this occasion by His disciple Lalit Bhattacharya. Babaji Mahasaya obliged, by coming to Bishnupur with His entourage. He reached Bishnupur by train at around 3'O'clock in the afternoon. Babaji Mahasaya along with His group was put at the local girl's school. The school ,was closed for summer vacation. Within half an hour of Babaji Mahasaya reaching Bishnupur a rumor spread that there could be trouble if the Kirtaan procession proceeded to Lalbandh. All the seniors were very much worried. At night Adwaita Das appraised Babaji Mahasaya of the tense situation and advised Him not to visit Lalbandh with the Kirtaan procession. Babaji Mahasaya was a bit annoyed and irritated. He replied that Kirtaan was neither His nor Adwaita Das's. It belonged to none other than Radharaman ( Bodo baba ). Hence it was their duty to pray to Radharam and to Nitaichand – the founder of Kirtaan , to overcome all hurdles. Nothing more was spoken that night. Next morning everybody was surprised to see that the school building was surrounded by a huge posse of armed policemen. Babaji Mahasaya woke up as usual, performed His daily duties and ordered the Kirtaan to start. 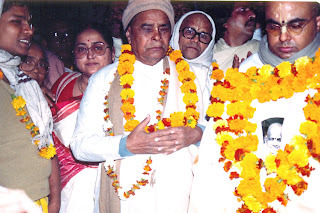 On the right and left of Babaji Mahasaya were the two Srikhol players Madan Das and Janaki. Behind Him were Adawita Das, Gopal Das, Bhagaban Das, Priyalal Das and others. The residents of Bishnupur followed. The whole procession was led from front by the two bearers of Sri Khunti. After falling prostrate on the ground and paying due respect to everybody Babaji Mahasaya started chanting the Sri Naam. The solemnity and fervour of the ambience cannot be described in a few words. It suffice to say that the residents of Bishnupur had not seen anything of this stature before. They joined the procession in numbers. They fell on the ground in frenzy as tolled down their cheeks. While a few gathered to see the confrontation as procession reached Lalbandh and some for the fun of it. The advancing procession was surrounded by the police contingent. Actually the police protection it ranged by Chandra Bhusan Dutta, a highly placed official of Bankura Judge's court. As the procession reached a short distance from Lalbandh, there was trouble. Hundreds of people armed with sticks, spears and axe started shouting obscenities. They dared the procession to come forward. The situation was extremely tense but the Kirtaan continued even though everybody apprehended trouble. Suddenly at the blowing of a whistle, the policemen rushed forward, ahead of the procession. The trouble makers were warned and the policemen knelt down, Inking guard and aiming their guns towards them. In flash Babaji Mahasaya broke the police cordon lay prostrate on the ground and then proceeded chanting the name of the Lord. The others stayed back. As Babaji Mahasaya went ahead towards Sarvamangala temple he was garlanded by Rishikesh Kaviraj. Suddenly there was a dramatic change. All those who stood there to pounce on Babaji Mahasaya joined Him in Sankitaan. Babaji Mahasaya could not be recognized when He returned back to the school. His entire body was covered with sandalwood paste and many garlands decked His neck. Bishnupur became a witness to a historic occasion which can only be compared to Nityananda Prabhu's unarmed struggle and victory over the tyrannical Kazi of Nabadwip hundreds of years ago. Why hanker for this and that? You have nothing more to ask for as you have got your Sri Gurudeva. Did you ever imagine in your dreams of your present situation? Think of your self. That would be more than enough. You do not deserve, nor can you demand what you have been endowed with. Every morning after rising one has to tell the Lord — Make me as you would like to. I should not be a slave of my nature. Whenever you are derailed from your desired path by your material senses you must immediately pray to your Lord — Sri Gurudeva to lead you from your sins and temptations towards salvation. For He has the power to free you from the slavery of your senses. Likewise before going to bed think of your wrong doings. You should be sincere in your efforts to get receive His blessings. By swimming along with the tide you would not get anything. When you are devoid of devotion you are left with nothing. This applies to both the material world as well as the world of religion. In the material world after we are disillusioned we turn devoted. In the world of religion devotion is must since the beginning. Surrender self. Everything belongs to the Lord. Those who renounce everything take His shelter. They can leave everything for Him. But the materialistic man leaves Him for his family. When a sapling is planted, a fence is built around it. When the fence is loosened the sapling can be easily destroyed. Devotion is like a fence and discipline is like a guard. Only fencing will not do. One has to guard the sapling from other elements too. When the sapling transforms into a tree it gives shelter to those who could have destroyed it earlier. It is said that one who falls on the ground gets up from the same ground Likewise the person you have wronged is the only one who can pardon you. With deep grief and pain in my heart I am announcing that my Gurudeva, the Mahanta of Sri Pathbari Asram and the backbone of Radharaman Gan, Sri Srimad 108 Madhusudan Das Babaji has left this world to enter the nitya lila on the moring of 17th December, 2007. He was 92 . Previously, he had been suffering from age-related illness and was admitted to the hospital. A few years after the disappearance of his beloved Gurudeva Sripad 1008 Ram Das Babaji, he started taking care of Pathbari and all its 40+ branches as Mahanta, head of the Asram. Thus Gurudeva has been serving his Gurudeva's mission for more than 60 years. In such way he has been acting as a big banyan tree under which saints and devotees could take secure shelter for their own bhajan process. Pathbari and its associated branches has been acting as the main back bone of the Gaudiya Vaishnava samaj specially in Bengal and Orissa by maintaining various lila places of Sri Sri Nitai Gour and by conducting various lila festivals like Jhali Samarpan, Gundicha Marjan, Oriya-Gaudiya Milan, Ratha Yatra etc. as started by Sri Sri Radharaman Charan Das Dev. Thus almost all the gaudiya vaishnava paramparas, Goswamis of Nityananda Prabhu Vamsha and Adwaita Prabhu Vamsha, descendants of associates of Sri Sri Nitai Gour take part in all these festivals arranged by Sri Pathbari for years in Bengal, Orissa and Vrindavan. My Gurudeva acted as a dedicated soldier to maintain all these festivals as started by his Guru Varga. Thus he was very well-known and popular within the Gaudiya Vaishnava samaj for years. Nityanand Vamsa and Adwaita vamsha used to give very special respect to him. He was even loved by saints outside the Gaudiya Sampradaya. Over the years he earned so much respect among saints even his elder godbrother and crown jewel of Pathbari, great Bhagavata Pathak Nityalila Prabista Pandit Sri Srimad Krishnananda Das Babaji (Pandit Kedar Ray) used to reserve great respect for my Gurudeva, although he was senior to him; sometimes Krishnanda Das Babaji used instruct his disciples not to offer dandavat to him without first offering dandavat to the Mahanta (My GuruDeva). Thus, this was a great loss to us and the vaishnava samaj in general. My Gurudeva and his elder brother, the great bhajananandi saint Srimad 108 Shyamananda Das Babaji, were initiated by Sripad Ram Das Babaji and came into his fold in their childhood. Since then these two brothers lived together in Pathbari Asram for years. After that long journey Sri Srimad 108 Shyamananda Das Babaji was forced to say good bye to his younger brother after 92 years of association. This is a prayer to the Vaishnava samaj to pray to my Gurudeva's beloved Sri Nitai-Gour to keep him always in Their divine association. In the picture above Srimad Madhusadan Das Babaji is chanting at the bank of RadhaKunda after having a bath at Shree Kunda. On the Back we can a glimpse of Srimad Hridayananda Das Babaji. In the picture above Babaji Maharaja is in Vrindavan during RasPurnima with devotees of pathbari. With Pandit Sri Ananta Das Babaji at Shree Radhakunda. It is my pleasure to announce I have decided to start posting in a new blog called nitaisundar.blogspot.com. The main reason behind this decision is, presently in this blog I am acting as a poster by the invitation of Vishakha and Sakhicharan ji. As they have few moments from Sri Radhakunda to access the internet to keep this blog updated with approval of viewers comments, and as I do not have that administrative permission to do the same, I felt to introduce new blog where I can have admin permission for more rapid interaction with curious devotee around the world. Hope it will make some of my old friends on internet happy.